I didn’t put a single stitch into fabric at all during August. I’m very disappointed with myself! 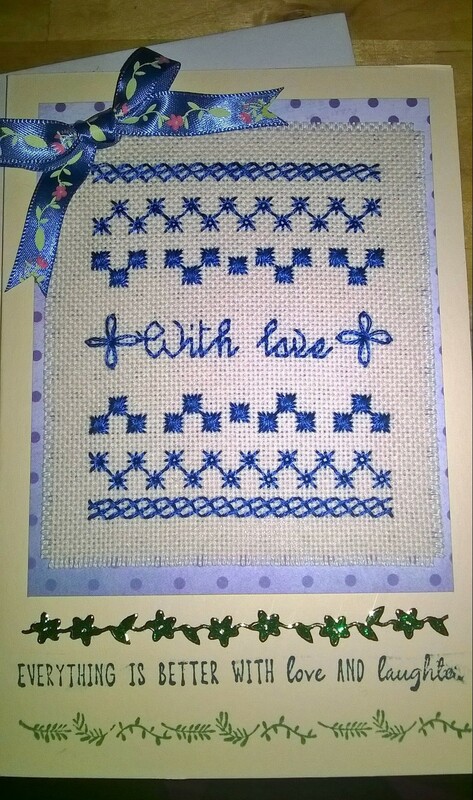 Instead, I’ve been trying out new crafts here and there, and making up some old finished cross stitches into cards and hangings. Most of these weren’t stitched by me, but were done by my Nana before she lost her eyesight. I couldn’t bear the thought of her throwing them out, so I’ve tidied them up as best I can and we’ve together made them into cards for her to send to her friends or keep for herself. I’ve been trying out a die cutting machine, which is pretty new for me as well – that was a lot of fun! 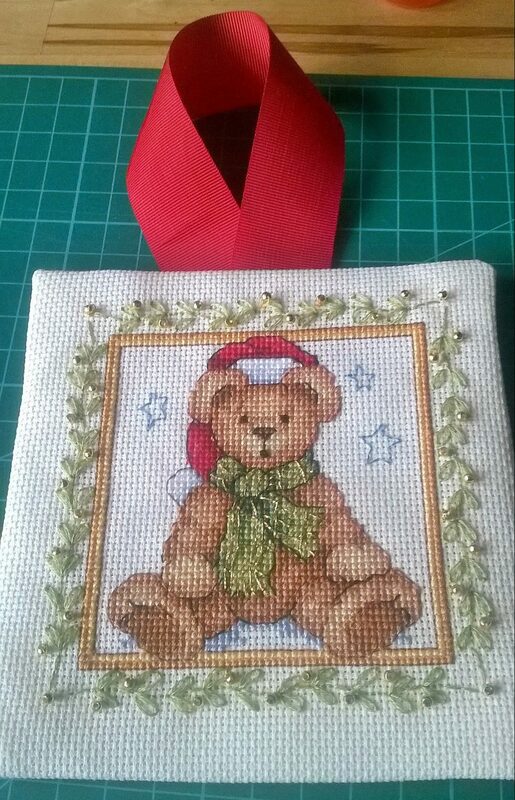 This is Mr. Christmas Teddy from a few months ago, made into a padded tree hanging. 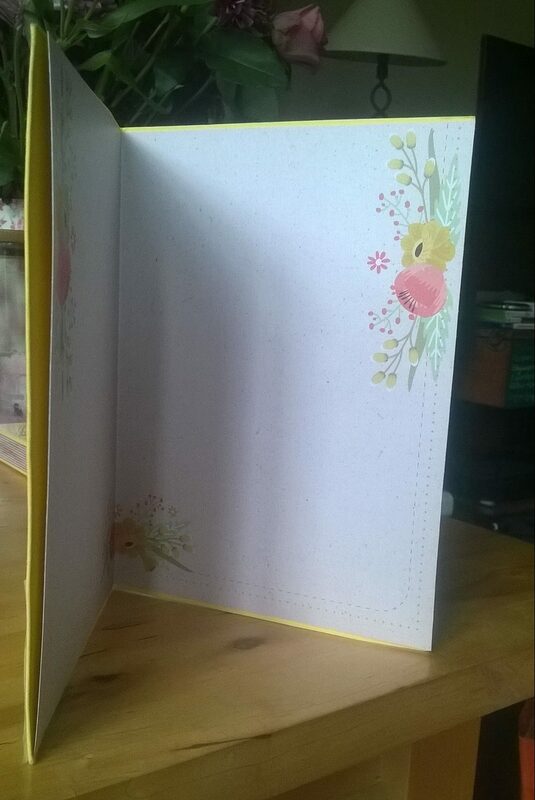 This was my first go at die cutting. The choices of embellishments were my Nana’s, as was the embroidery. I just did the cutting and sticking and so on! 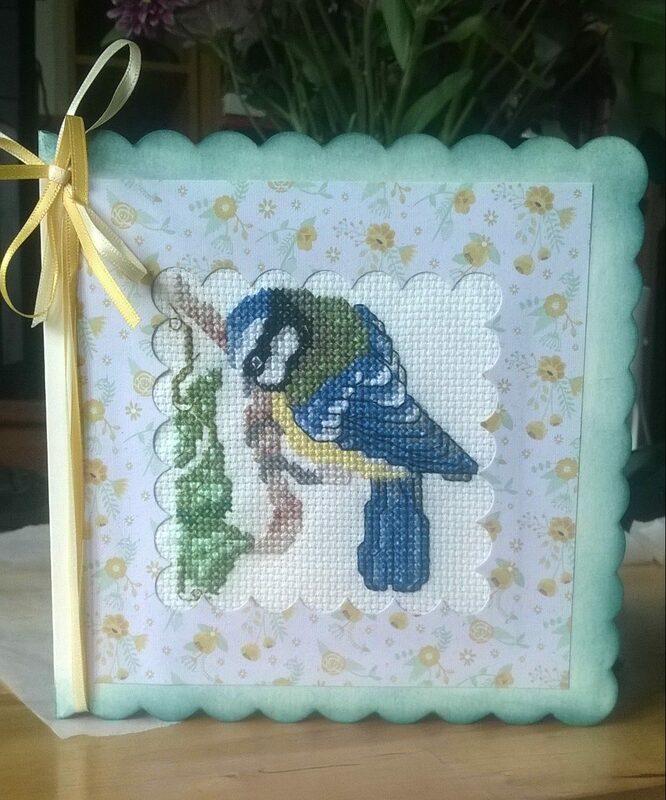 These cute little garden bird buddies were Nana’s embroideries too. I made them up into a sort of matching set of cards, because they were too small to really do much else with, but still too large for an aperture card. I hate how this one came out. 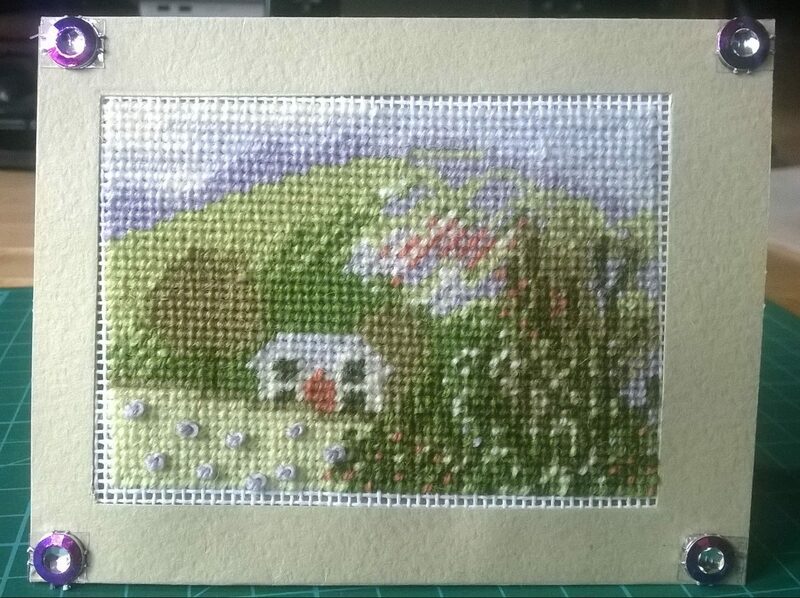 The card stock was too floppy for the weight of the tapestry wool, the aperture is off centre and the picture doesn’t quite fit at all. 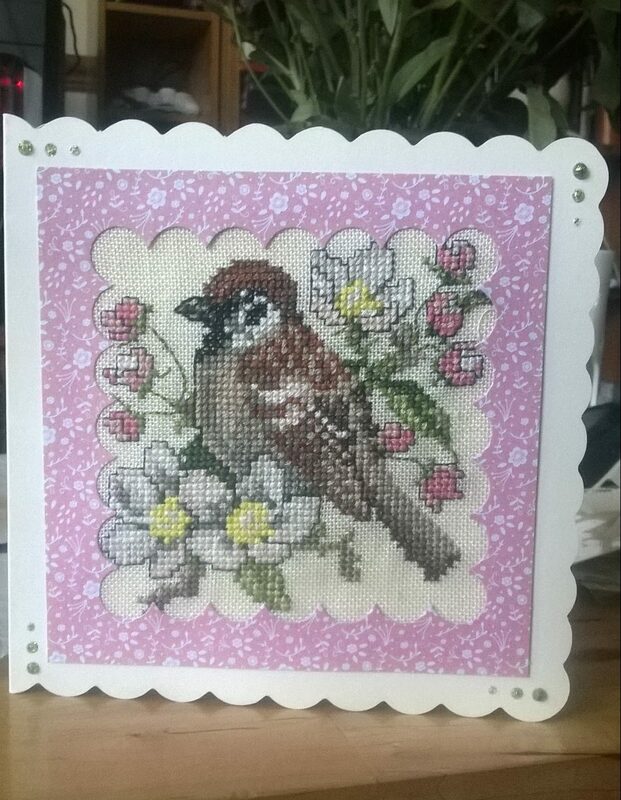 I’m going to take it out and mount it onto a make up bag instead – but it’s important to record my failures as well as my successes in craft and in life I think! 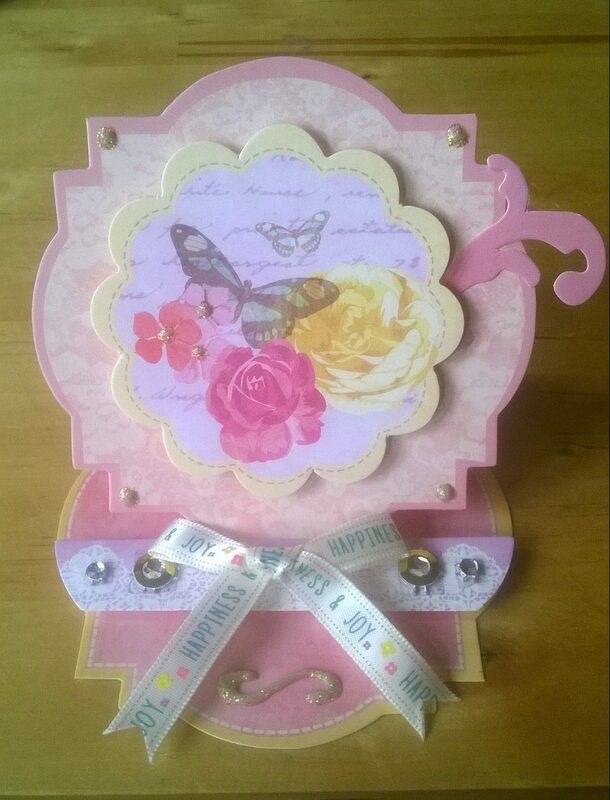 I hope September will see me get back into crafting a bit more, as I start a new job (yet again!) with more regular lunch breaks for extra stitching time! I hope everyone else has had a fun and productive month too! I’m still on the road to recovery, and it’s a slow one but I think I’m nearly there. I got back in a car yesterday for the first time since the accident, and I’m feeling better every day. In fact, I hope that by the end of next week I will be able to call myself fully recovered. 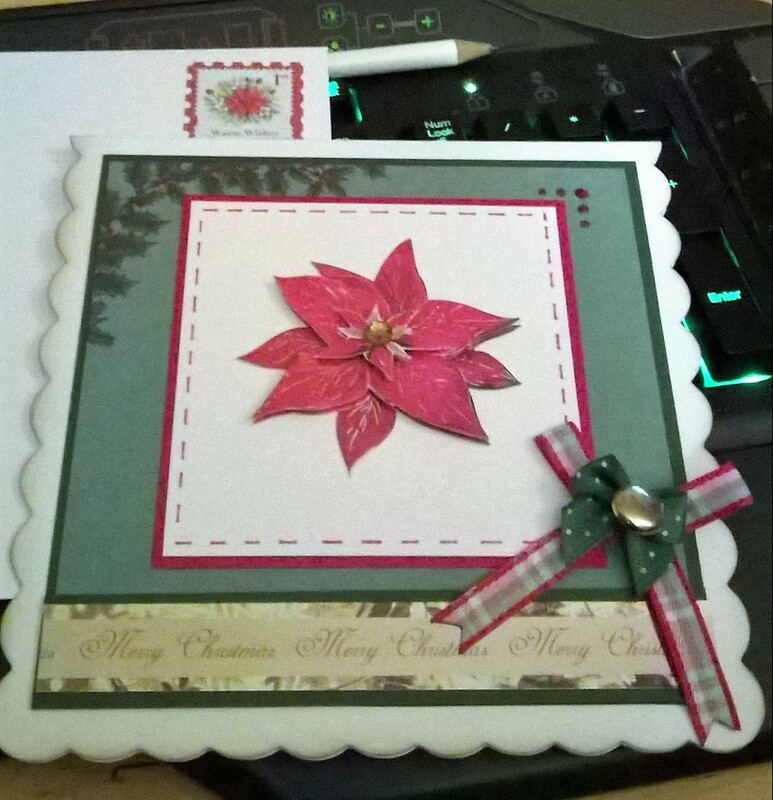 In the mean time, I wanted to show you a couple of the Christmas cards and things I made, or at least the ones I remembered to take photos of! 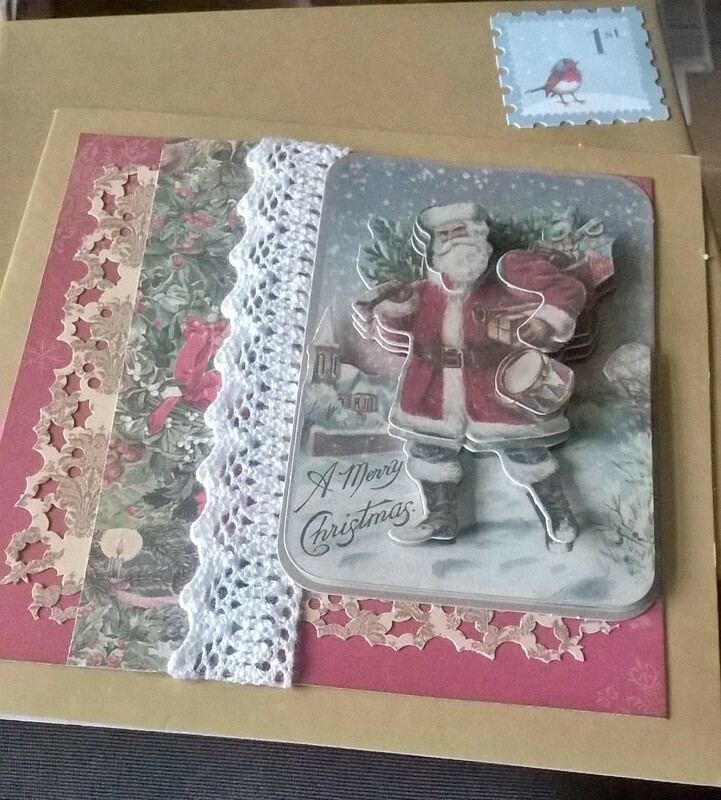 I got given a sort of starter-set of card making goodies in this Victorian Christmas theme, and had a fun few afternoons putting together as many cards as possible. I’m still pretty new to card making, and I think I went totally overboard with the glitter and ribbon and gems and whatnot! Even though it might not be what most would call ‘tasteful’, I had fun and I liked the end results because shiny things make me happy! Plus I enjoyed the thought of the card recipients opening their post and being showered with sparkles falling from the envelope. I also started making another Christmas ornament from the Beaded Elegance set featured in a previous post, and I will try to get it finished for next Christmas! For my New Year’s resolution this year, I have quit taking sugar in my tea and I am proud to say that 9 days and about 50 cups of tea later, I am sticking to it. Has anyone else made a New Year’s resolution? Is this an English thing or does it happen in other countries too? Let me know! Happy New Year and Happy Stitching to you all! 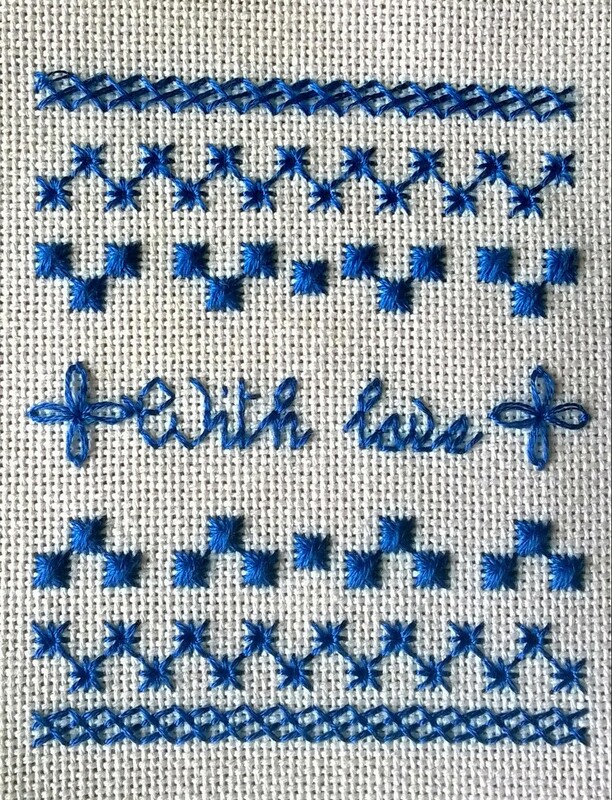 I’ve been so busy this week that I barely stitched a single little X on any of my projects! Instead, a very kind lady at my office has been giving me a sort of introduction to paper craft, and I’ve been trying my hand at something a little different. I’ve made a few paper craft cards before for Christmases past, but I’ve never had a proper lesson on the basics, I’ve always just sort of made it up as I go along. 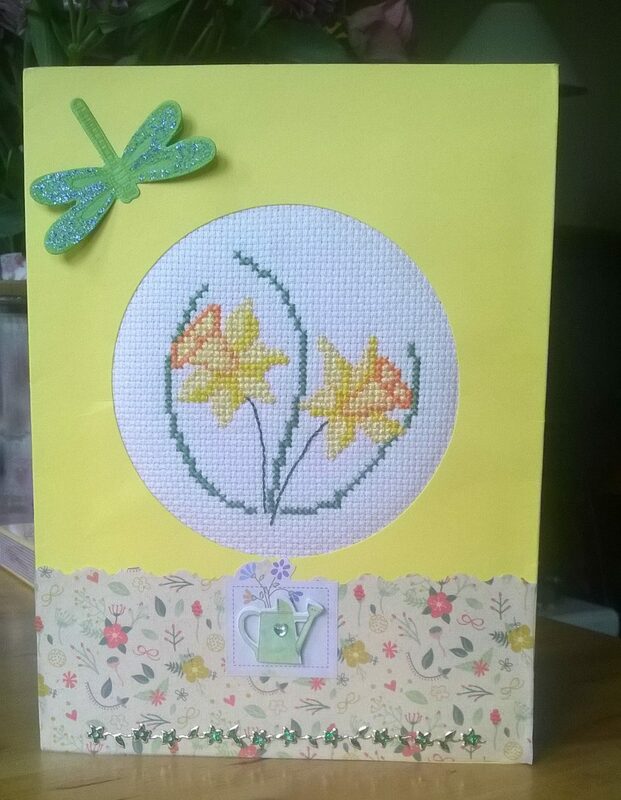 So, instead of a stitching post this week, I want to proudly show off my first ever decoupage card! I know that to my very talented and experienced readers, this is probably laughably simple but nevertheless, I’m really pleased with it! I spent so long with my little craft knife cutting around those petals oh-so-carefully, hoping it would turn out how I wanted. I have so much new found respect for papercrafters who make it look so easy to just swoop their knives around and produce perfect swirls and curves! 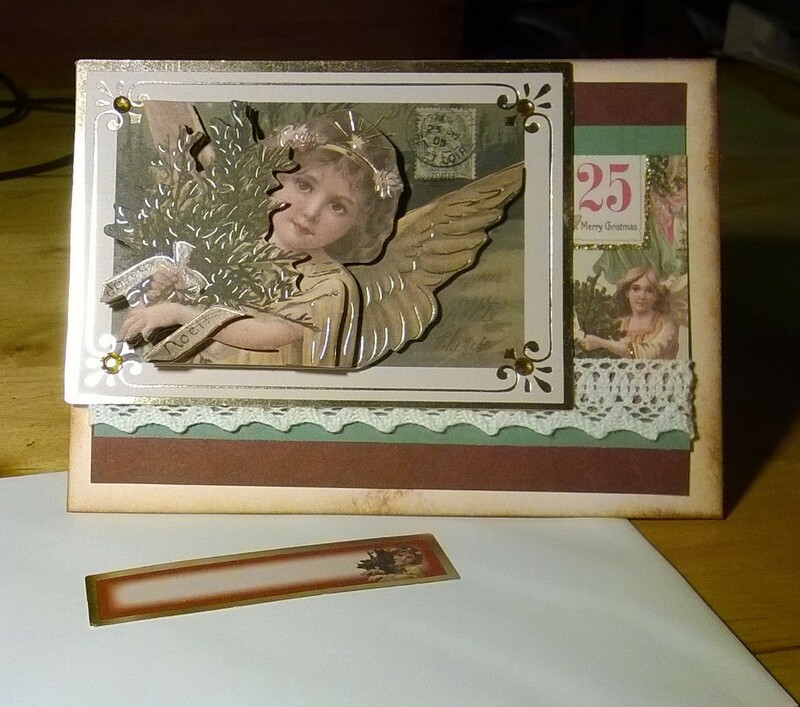 I hope with practice and a few more lessons I’ll be turning out a batch of beautiful decoupage cards to go with my stitched ones this year. And of course, as the weeks count down, I wish all my readers the very best of luck and speediest of needles for their own Christmas preparations! Cover Kits With A Twist! I love getting cover kits off magazines, because they are the absolute perfect size to carry around in my handbag and stealthily stitch on my lunch-breaks. They are almost invariably really high quality little designs as well, so it’s great to get them for a free bonus gift. On the other hand, I tend to feel a little bit like I’m cheating when I stitch a design without any changes or personal input. I like to put a bit of my own creativity in everything I do, which can be difficult with such limited materials. The solution – I spent a few days digging up some old cast off card-making and paper-crafting bits and bobs from friends, and learning a few tricks of the trade, to help personalize these designs.